CD137 (ILA/4-1BB), a member of the TNF receptor family, was shown previously to inhibit proliferation and to induce apoptosis in T lymphocytes. In this study, we identify CD137 as a novel and potent monocyte activation factor. CD137 protein induces expression of IL-6, IL-8, and TNF-α, and inhibits expression of IL-10. Furthermore, CD137 differentially regulates expression of cell surface receptors. It induces expression of ICAM and reduces expression of FcγRIII, while levels of HLA-DR remain unchanged. CD137 also promotes adherence of monocytes. These effects of CD137 require immobilization of CD137 protein, indicating that they are mediated by cross-linking of a corresponding ligand/coreceptor expressed on monocytes. The TNF receptor family consists of 13 members characterized by cysteine-rich pseudo-repeats in their extracellular domains. TNFR I and II, TNFR-related protein, p75 nerve growth factor receptor, CD27, CD30, CD40, CD95 (Fas/Apo-1), CD137 (ILA3/4-1BB), OX40, herpesvirus entry mediator (HVEM), APO-2 (DR-4), APO-3 (DR3/WSL-1), and some viral homologues regulate diverse physiologic programs such as proliferation, differentiation, and programmed cell death (1, 2, 3). The ligands for these receptors also form a family of structurally related proteins (4). The human and murine genes induced by lymphocyte activation (ILA) and 4-1BB have been identified in screens for receptors expressed on activated lymphocytes (5, 6, 7) and have recently received the nomenclature CD137 (8). CD137 is expressed by activated T and B lymphocytes and monocytes, and expression in primary cells is strictly activation dependent (9). The gene for human CD137 resides on chromosome 1p36, in a cluster of related genes, and this chromosomal region is associated with mutations in several malignancies (10). Abs to CD137 and cells transfected with the cDNA for the membrane-bound form of the ligand costimulate proliferation of activated T cells (11, 12, 13), and CD137 ligand expressed by B lymphocytes costimulates T cell proliferation synergistically with B7 (14). Injected, agonistic anti-CD137 Abs activate T cells sufficiently for rejection of tumors in mice (15). While agonistic Abs and the ligand to CD137 enhance lymphocyte activation, the CD137 protein has the opposite effect. It inhibits proliferation of activated T lymphocytes and induces programmed cell death. These T cell-inhibitory activities of CD137 require immobilization of the protein, arguing for transmission of a signal through the CD137 ligand (12). Bidirectional transduction of signals through the receptor as well as the ligand has also been suggested for the OX40, CD40, and CD30 receptor/ligand systems, three other members of the TNF receptor and ligand families (16, 17, 18, 19), and the EPH family receptor Nuk and its transmembrane ligands, which are implicated in the regulation of axon guidance, fasciculation, and compartment definition (20). The murine CD137 ligand is expressed constitutively by stromal cells of the bone marrow and thymus, macrophages, and B cells, and its expression is inducible in T cells (13, 21). Constitutive expression of the human CD137 ligand was reported for monocytes, B cells, and neuroblastoma cells (7). The human and murine CD137 ligands display only 36% homology, compared with 70 to 80% of human-mouse interspecies homology for other TNF family members, implying the existence of yet other, unidentified CD137 ligands. Monocytes play an essential role in immune surveillance. Dysregulated monocyte activation has been implicated in autoimmune diseases as well as immune deficiencies (22). The process of monocyte activation and especially the regulation of their diverse functions are only partially understood. The ability to modulate monocyte activation and functions would be of eminent therapeutic significance. In this study, we show that the CD137 ligand system induces monocyte activation, and that this is mediated by signaling through the ligand/coreceptor. OKT3 was recovered as a hybridoma supernatant and titrated for optimal T lymphocyte proliferation. LPS (Salmonella abortus equi) was kindly provided by C. Galanos (Max-Planck-Institut, Freiburg, Germany). Anti-Fc Ab was purchased from Sigma Chemical Co. (St. Louis, MO), anti-CD16 from CLB (Amsterdam, The Netherlands), and anti-CD54 and anti-HLA-DR from Dianova (Hamburg, Germany). Human PBMC were prepared by Percoll gradient density centrifugation, as previously described (23). Primary T lymphocytes were isolated by T cell enrichment columns, according to the instructions provided by the manufacturer (R&D Systems, Minneapolis, MN). Primary B lymphocytes were isolated by anti-CD20 coupled to magnetic beads (Miltenyi, Bergisch Gladbach, Germany). Primary monocytes were isolated by elutriation, as described previously (24). Elutriated monocytes were more than 95% pure, and contaminating T lymphocytes were less than 3%, as estimated by morphology and antigenic phenotype (CD14, CD3, CD4, CD8 expression). Unless indicated otherwise, cells were cultured in polystyrene dishes (Becton Dickinson, Franklin Lakes, NJ) in RPMI 1640 supplemented with 5% FCS at a concentration of 106/ml. Monocytes cultured in Teflon bags were supplemented with 2% human serum type AB (Pan Systems, Aidenbach, Germany), as described previously (25). Resting PBMC, and PBMC activated with 0.1 and 1 ng/ml anti-CD3 (OKT3) were cultured on plates coated with 10 μg/ml of the constant domain of Ig (Fc) or a fusion protein, consisting of the extracellular domain of CD137 and Fc (CD137-Fc). Aliquots of PBMC were harvested after 6 and 18 h. Poly(A)+ RNA was isolated from 5 × 106 PBMC using RNAzol B (Tel-Test, Friendswood, TX) and the Poly(A)Ttract system (Promega Corp., Madison, WI). First-strand cDNA synthesis was performed with 3% of isolated mRNA in a 40-μl reaction. Two-nucleotide-anchored oligo(dT) primers (1 μM), 400 U SuperScriptII RNaseH-RT (Life Technologies, Eggenstein, Germany), and 25 μM dNTP were used. Five percent of the reverse transcriptase reaction served as template for PCR with decameric primers. PCR was performed in 20 μl vol with 1 U Taq DNA polymerase (Boehringer Mannheim Corp., Mannheim, Germany), 200 μM dNTPs, 1.5 mM MgCl2, 10 mM Tris, pH 8.3, 50 mM KCl, and 10 μM of each primer. After a 5-min denaturation step at 94°C, the reaction proceeded in 40 cycles of 1 min at 94°C, 1 min at 40°C, and 10 s at 72°C, followed by 10 min at 72°C. Reaction products were separated on nondenaturing polyacrylamide gels. One-third of the PCR reaction was loaded on a nondenaturing 10% polyacrylamide gel, and electrophoresis was performed at 200 V for 10 min, followed by 500 V for 1 h. For detection of DNA fragments, the gel was silver stained. Differentially regulated PCR products were excised from the gel and isolated by shaking for 2 h in 50 μl 10 mM Tris, pH 8, at 65°C. Fragments were reamplified by 40 cycles of PCR using identical primers as in the first PCR, purified by PCR purification kit (Qiagen, Hilden, Germany), cloned into pT7Blue(R) (Novagen, Madison, WI), and sequenced. ELISA kits were purchased from R&D Systems (Wiesbaden, Germany) and performed according to the manufacturer’s instructions. Cytokine concentrations in triplicate supernatants are expressed as mean ± SEM. Cells were analyzed using a FACScan (Becton Dickinson, Mountain View, CA). A quantity amounting to 5 × 105 cells per condition was washed twice in cold PBS, containing 0.06% Ig (Sandoz Pharma AG, Basel, Switzerland), incubated with primary, Ag-specific Abs or isotype-matched control Abs, washed, and incubated with saturating concentrations of FITC-conjugated goat anti-mouse IgG (Jackson ImmunoResearch Laboratories, West Grove, PA) for 30 min at 4 C. Cells were washed an additional two times and fixed with 1% paraformaldehyde in PBS. To identify genes that are regulated by CD137, we performed differential display PCR. Only PCR fragments that appeared to be regulated differentially by CD137 in resting and in activated PBMC, at 6 and 18 h of culture, and whose intensities were modulated by CD137 at least by a factor of 5, were included in further analysis. Two fragments that were obtained by independent PCR reactions, using different pairs of primers, turned out to be fragments of the IL-8 cDNA. According to the results from the differential display PCR, CD137 induced IL-8 mRNA expression (not shown). We confirmed induction of IL-8 mRNA expression by CD137 by Northern blot analysis (Fig. 1⇓A). IL-8 mRNA was induced 10-fold by CD137, as determined by densitometry of the autoradiograph. IL-8 protein in supernatants of CD137-treated and control PBMC was measured by ELISA. We found a 10-fold induction of IL-8 protein by CD137 in supernatants of PBMC, matching the degree of induction of IL-8 mRNA (Fig. 1⇓B). Induction of IL-8 by CD137. A, Resting PBMC (5 × 107/condition) were plated on tissue culture plates coated with 10 μg/ml Fc or CD137-Fc protein. Total RNA was isolated after 8 h and analyzed by Northern blot analysis. Hybridization was performed with the IL-8 cDNA fragment isolated by differential display PCR. Equal load of RNA (20 μg/lane) was controlled by a rehybridization with β-actin cDNA. B, Supernatants of cultures from A were harvested after 8 h, and concentrations of IL-8 were determined by ELISA. Identical results were obtained with cells from eight different donors in five independent experiments. Investigating purified subpopulations of PBMC, we found that IL-8 was produced mainly by monocytes, to a lesser extent by B lymphocytes, but not by total lymphocytes and purified T lymphocytes (Fig. 2⇓A). Furthermore, IL-8 could not be induced by CD137 in the T and B cell lines Jurkat, Molt4, and Raji, respectively (not shown). IL-8 is induced in monocytes, but not in lymphocytes. A, 105 primary T and B lymphocytes and monocytes were plated in 100 μl on tissue culture dishes coated with 10 μg/ml Fc and CD137-Fc, respectively. Supernatants were harvested after 16 h, and concentrations of IL-8 were determined by ELISA. Comparable results were obtained with cells from three different donors in two independent experiments. B, Dose-response curve of IL-8 induction by CD137. A quantity amounting to 105 primary monocytes in 100 μl was plated on tissue culture dishes coated with indicated concentrations of Fc or CD137-Fc protein. The concentration of IL-8 was determined after 16 h.
The level of cytokine induction was a direct function of the concentration of CD137 protein (Fig. 2⇑B). Coating with as low as 100 ng/ml of CD137 protein did result in a significant induction of IL-8 in monocytes. Having demonstrated induction of IL-8 in monocytes by CD137, we reasoned that other cytokines may be regulated by CD137 as well. We found induction of IL-6 and TNF-α by CD137 in monocytes (Fig. 3⇓A). No IL-12 was induced by CD137 (not shown). Regulation of cytokine synthesis by CD137. A, 105 primary monocytes in 100 μl were plated on tissue culture dishes coated with 10 μg/ml Fc or CD137-Fc protein. Supernatants were harvested after 16 h, and concentration of IL-6, IL-8, and TNF-α was determined by ELISA. B, Time course of IL-8 induction by CD137. A quantity amounting to 105 primary monocytes in 100 μl was plated on tissue culture dishes coated with 5 μg/ml Fc or CD137-Fc protein, with and without the addition of LPS (10 ng/ml). IL-8 concentrations were determined at indicated times. C, Monocytes were exposed to LPS (50 ng/ml) or immobilized CD137-Fc (10 μg/ml), or both. Supernatants were harvested after 16 h, and concentrations of IL-10 (left panel) and IL-1Ra (right panel) were determined by ELISA. There was no difference between LPS alone and Fc + LPS (not shown). The experiments were performed twice with cells from independent donors and similar results. CD137 exerted its effects on cytokine release within the first 16 h of culture, and levels of IL-8 remained at its maximum for 5 days (Fig. 3⇑B). LPS is a key activator of monocytes. To assess the potency of CD137 as a monocyte activator, we compared the efficiencies of the two molecules in inducing cytokine release from monocytes. Maximal induction of IL-8 by LPS was already achieved at a concentration of 10 ng/ml (not shown) and was about twofold higher than the IL-8 level induced by CD137 (Fig. 3⇑B). A potential interaction of the two molecules was examined by exposing monocytes to the combination of LPS and CD137. CD137 further enhanced the maximal levels of IL-8 induced by LPS. CD137 did not induce expression of IL-10, rather it reduced the expression of IL-10 in activated monocytes. CD137 and LPS did induce expression of IL-1Ra, and a slight decrease in IL-1Ra levels was obtained with the combination of CD137 and LPS (Fig. 3⇑C). We wanted to verify that the observed effects of CD137 on monocytes were genuine and not due to some nonspecific activation or endotoxin contamination associated with the CD137 protein preparation. Plates were coated with an anti-CD137 Ab (M127) or an isotype-matched control Ab (mouse IgG). After blocking of nonspecific binding sites, Fc and CD137-Fc proteins were added, plates were washed, and PBMC were cultured in these wells for 16 h. In this study, IL-6 as a readout cytokine was only produced by cultures in which CD137-Fc protein was presented by the anti-CD137 Ab (Fig. 4⇓A). 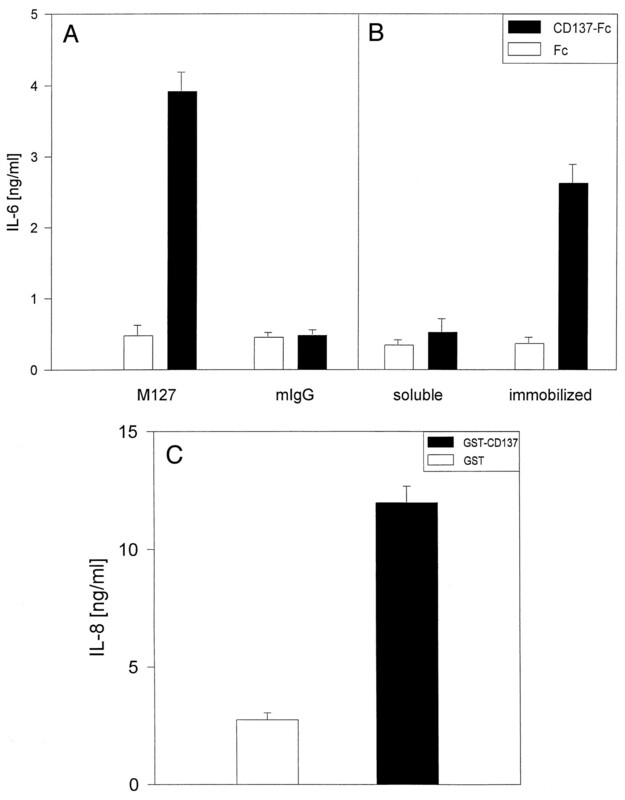 In addition, blocking of the protein-binding capacity of the tissue culture plates before addition of PBMC and CD137-Fc protein to the cultures completely inhibited induction of IL-6 (Fig. 4⇓B). The presence of soluble CD137 did not induce IL-6. Verification of IL-8 induction by CD137. A, Tissue culture plates were coated with mouse IgG (mIgG) and the anti-CD137 Ab M127 (10 μg/ml) at 4°C overnight. Unspecific binding was blocked by 3% dry milk in PBS for 1 h at room temperature. Fc and CD137-Fc proteins (10 μg/ml) were added for 1 h at room temperature, and unbound protein was removed by washing with PBS and 0.05% Triton X-100. PBMC (105) were plated in each well, and IL-6 concentrations in 16-h supernatants were determined by ELISA. B, Tissue culture plates were left untreated (immobilized), or incubated with FCS for saturation of their protein-binding capacity (soluble), before PBMC (105/well) and Fc or CD137-Fc proteins (10 μg/ml) were added. IL-6 concentrations in 16-h supernatants were determined by ELISA. C, 105 resting PBMC were plated on tissue culture plates coated with 10 μg/ml GST and GST-CD137, respectively. Concentrations of IL-8 were determined by ELISA in 16-h supernatants. As a second control experiment, we tested effects of CD137 protein isolated from a different source. CD137 produced by the baculovirus expression system as a fusion protein with glutathione S-transferase (GST) (26) induced expression of IL-8 as efficiently as did the CD137-Fc protein (Fig. 4⇑B). Another fragment identified in the differential screen as being down-regulated by CD137 was FcγRIII (CD16). Using Northern blot analysis, we confirmed a reduction of FcγRIII expression by about one-half in monocytes in response to CD137 (Fig. 5⇓A). Expression of CD54 (ICAM) was enhanced by about 50% by CD137 (mean = 135 vs 90), while levels of HLA-DR expression remained unchanged (mean = 108 vs 113) (Fig. 5⇓B). Regulation of surface receptor expression by CD137. A, 5 × 107 primary monocytes were plated on tissue culture dishes coated with 10 μg/ml Fc or CD137-Fc protein. RNA was isolated after 16 h and analyzed by Northern blot analysis. Hybridization was performed with the FcγRIII cDNA fragment isolated by differential display PCR. Equal load of RNA (20 μg/lane) was controlled by a rehybridization with β-actin cDNA. B, Monocytes were cultured in Teflon bags at a concentration of 106 cells/ml. Fc or CD137-Fc protein (2 μg/ml) was added and cross-linked by anti-Fc Ab (4 μg/ml). Monocytes were stained for expression of ICAM (upper panel) and HLA-DR (lower panel) after 16 h. Identical results were obtained with monocytes from two different donors in two independent experiments. In the PBMC cultures used for differential display, we noticed that CD137 greatly enhanced adherence of cells, which had the appearance of monocytes, to the tissue culture dishes (not shown). We confirmed the adherence-promoting effect of CD137 on primary monocytes by plating monocytes on dishes to which they adhere only weakly. Monocytes plated on CD137-Fc-coated dishes displayed a profoundly enhanced attachment within 2 h of plating of the cells. Significantly fewer cells attached when monocytes were plated on Fc-coated or uncoated dishes. In addition, dishes coated with an Ab to HLA-DR did not lead to an enhanced attachment of monocytes (not shown). Adherence of monocytes was enhanced by immobilized CD137, but not by soluble CD137 (not shown). This result is consistent with induction of IL-6 by immobilized, but not by soluble CD137 (Fig. 4⇑B). 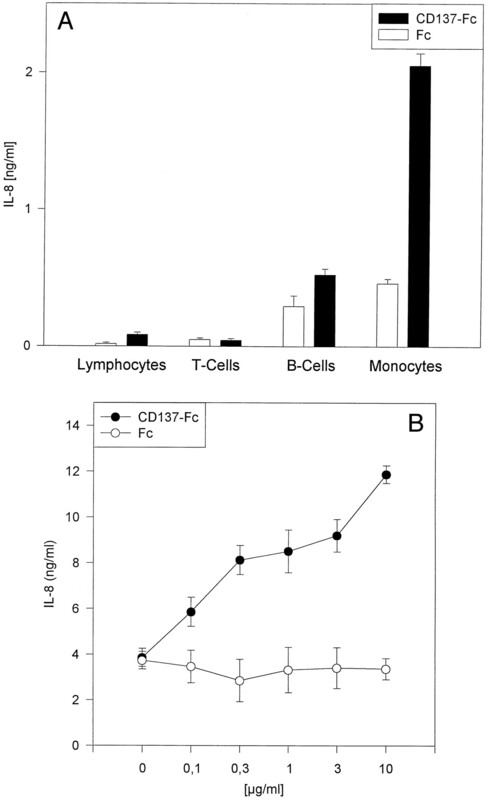 Alternatively to immobilization of CD137 protein on tissue culture plates, soluble CD137-Fc protein could be used for induction of cytokines when it was cross-linked via anti-Fc Abs (Fig. 6⇓). Immobilization of CD137 is required for monocyte activation. Monocytes were cultured in Teflon bags at a concentration of 106 cells/ml. 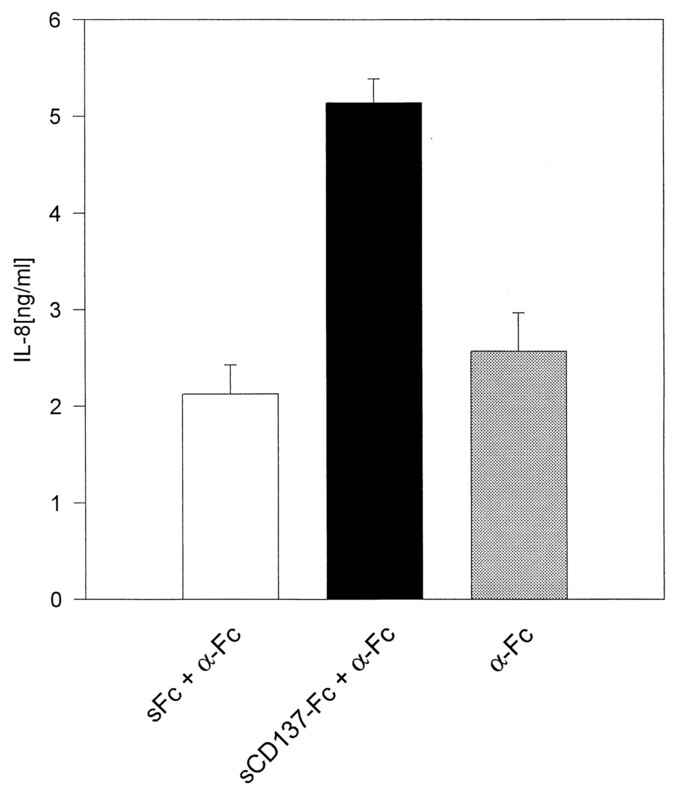 Fc and CD137-Fc proteins (2 μg/ml) were added and cross-linked by anti-Fc Ab (4 μg/ml). Concentrations of IL-8 were determined after 16 h. Identical results were obtained with monocytes from two different donors in two independent experiments. In a differential screen for genes of which the expression in PBMC is regulated by the TNF receptor family member CD137, we identified IL-8 and FcγRIII, two genes expressed by monocytes. In addition, we noticed that monocytes attached in by far greater numbers to culture dishes that were precoated with CD137 protein. These observations led us to an investigation of the influence of CD137 on monocyte functions. CD137 induced expression and release of cytokines by monocytes. Concentrations of cytokines induced by CD137 were in the same range as the ones found in gouty synovial fluid, emphyema fluid, and parapneumatic effusions (27, 28). Compared with LPS, CD137 proved to be a weaker stimulator of monocyte activation. As LPS is one of the most potent activators of monocytes, this result was not surprising. But interestingly, CD137 was able to further enhance the maximal levels of IL-8 elicited by LPS, indicating independent mechanisms of monocyte activation by the two molecules. In line with the induction of cytokines such as IL-6, IL-8, and TNF-α, which in general enhance immune responses, is the inhibition of IL-10, which is associated with a deactivation of monocytes (29). Therefore, one may conclude that CD137 participates in the regulation of the inflammatory cascade. The opposite effects of CD137 and LPS on IL-10 production also argue for separate monocyte activation mechanisms of the two molecules. IL-12 is a cytokine known for thriving and characterizing a Th1-type immune response. The circumstance that CD137 did not induce IL-12 suggests that CD137 may favor a Th2-, rather than a Th1-type immune response. CD137 induced cytokines mainly in monocytes. No induction or only weak induction of cytokines by CD137 was found for T and B lymphocytes, respectively. Activation of monocytes by CD137 was observed with cells from several donors and was obtained with PBMC, as well as with purified monocytes. However, about fivefold higher levels of cytokines were induced in PBMC compared with purified monocytes, indicating an enhancement of the CD137 effect by lymphocytes or other blood cells. CD137 also regulated expression of cell surface receptors on monocytes. The specificity of this regulation is evidenced by the selective and partially opposite regulation of different markers. The induction of ICAM, a monocyte activation marker, is consistent with the induction of cytokines that are produced by activated monocytes. Up-regulation of FcγRIII and MHC class II are features of monocytes differentiating to macrophages (30). CD137 had no effect on MHC class II expression and reduced FcγRIII, results in line with the concept of CD137 delivering rather an activation than a differentiation signal. Concomitantly with alterations in gene expression, CD137 enhanced the attachment of monocytes to tissue culture dishes. Since monocytes readily attach to many surfaces, the adherence-promoting activity of CD137 was best visible when tissue culture dishes were used, which on their own support monocyte attachment only poorly. This effect of CD137 on monocytes occurred fast and was already clearly visible 2 h after plating of the cells. Monocyte attachment mediated by CD137 is not due to a passive capturing of the cells, as evidenced by the accompanying morphologic changes, and also because anti-HLA-DR Abs had no influence on monocyte adherence. Induction of cytokine synthesis by adherence is a well-known phenomenon in monocytes (31, 32). In the case of CD137, induction of cytokine and ICAM expression is not a mere consequence of the CD137-mediated increase in the adherence of monocytes. In monocytes that were cultured under nonadherent conditions, cross-linked CD137 also induced expression of ICAM and IL-8. The sum of our data, the induction of cytokines, the induction of activation markers, the enhancement of adherence, and the reduction of expression of differentiation markers all argue for CD137 being a basic mediator of monocyte activation. To rule out that activation of monocytes by CD137 was due to some trivial cause such as a contamination of the CD137 protein preparation with endotoxin, we performed several control experiments. We demonstrated that 1) CD137 protein isolated from a different source induces cytokine synthesis as well; 2) CD137 protein, specifically captured and presented by anti-CD137 Abs, and after washing out any potential contaminants, still induced cytokine synthesis; and 3) administering CD137 protein in soluble form by preventing its immobilization did not induce cytokines. In addition, CD137 counteracted LPS-induced IL-10 synthesis. Engagement of FcR on monocytes can trigger cytokine release (33). Therefore, Fc protein served as a negative control in all of our experiments in which CD137-Fc fusion protein was used. Still, the possibility could not be excluded that the effects of CD137-Fc observed were due to a combined action of FcR and CD137 ligand engagement. However, the fact that a fusion protein consisting of GST and the extracellular domain of CD137 induced IL-8 as efficiently as the CD137-Fc fusion protein suggests that the activation of monocytes can be mediated solely by CD137. T lymphocytes receive an activation signal from CD137 cross-linking, leading to enhanced proliferation and an effective antitumor response (11, 12, 13, 14, 15). Monocytes do express CD137 ligand (7, 20) and are activated by cross-linking of the CD137 ligand. Therefore, a scenario is conceivable in which T lymphocytes and monocytes mutually activate each other via interaction of CD137 on lymphocytes with its ligand on monocytes, leading to an enhancement and perpetuation of an immune response. Supported by this view is the finding that CD137 induces a stronger cytokine expression in PBMC, as in purified monocytes. Activation of monocytes stands in contrast with the inhibition of proliferation and the induction of programmed cell death in T lymphocytes by CD137 protein (12). The clarification of the physiologic significance of these opposite effects of CD137 protein on T lymphocytes and monocytes will be an important topic of future experiments. Inhibition of proliferation and induction of apoptosis in T lymphocytes by CD137 protein require immobilization of the protein (12). Immobilization of CD137 protein was also necessary for activation of monocytes. Immobilization of CD137 could be achieved via coating of the protein to tissue culture dishes, or by addition of soluble CD137-Fc and cross-linking via anti-Fc Abs. This requirement for immobilization of CD137 protein implies transmission of a signal through a CD137 ligand, which is expressed on monocytes and T lymphocytes and is cross-linked by immobilized CD137 protein. The ligands for CD30, OX40, and CD40, other members of the TNF superfamily, have also been implicated in delivering signals to the cells they are expressed on (16, 17, 18, 19). Since in the TNF superfamily ligands occur not only as soluble, but also as membrane-bound proteins, a bidirectional transduction of signals through the receptor as well as the respective ligand is possible. Bidirectional transmission of a signal through receptor and ligand recently has been documented for an EPH receptor and its membrane-bound ligands (20). This mechanism probably allows a more precise fine tuning of immune responses by delivering a direct and immediate feedback signal to the ligand-bearing cell. Our data on CD137-mediated monocyte activation imply that it should be worthwhile to test whether inhibition of the interaction of CD137 with its ligand can inhibit or reduce monocyte activation and possibly ameliorate acute and chronic inflammatory diseases. We thank Gitte Krause and Ute Ackermann for excellent technical assistance, and Drs. M. Widmer and R. G. Goodwin (Immunex Corp., Seattle, WA) for CD137-Fc protein. ↵1 This project was supported by Deutsche Forschungsgemeinschaft. ↵2 Address correspondence and reprint requests to Dr. Herbert Schwarz, Department of Pathology, University of Regensburg, 93042 Regensburg, Germany. 3 Abbreviations used in this paper: ILA, induced by lymphocyte activation; GST, glutathione S-transferase; IL-1Ra, IL-1 receptor antagonist. Lewis, C. E., J. O’D. McGee. 1992. The Macrophage IRL Press at Oxford University Press, Oxford. Langstein, J., C. Buechler, and H. Schwarz. 1996. Recovery of functional, recombinant baculovirus produced proteins from insect cell inclusion bodies. In Technical Tips Online (http://www.elsevier.com/locate/tto). Identifier No. T40070. Krutmann, J., R. Kirnbauer, A. Kock, T. Schwarz, E. Schopf, L. May, P. Sehgal, and T. Luger. 1990. Cross-linking Fc receptors on monocytes triggers IL-6 production: role in anti-CD3-induced T cell activation. J. Immunol. 145:1337. Monocytes were cultured in Teflon bags at a concentration of 106 cells/ml. Fc and CD137-Fc proteins (2 μg/ml) were added and cross-linked by anti-Fc Ab (4 μg/ml). Concentrations of IL-8 were determined after 16 h. Identical results were obtained with monocytes from two different donors in two independent experiments.